Divers and snorkellers will take great delight in the lodge's protected house reef which teems with colourful marine life - you may even be lucky enough to spot turtles and manta rays! Delicious meals served up in the attractive restaurant area - expect the local fishermen's catch of the day to re-appear on your plate just hours later to delight your taste-buds! Not quite as easy to access as other lodges in Mozambique as you fly to Nampula before taking a 3 hour road transfer to the lodge - but once there the sheer seclusion of the location makes it more than worthwhile! 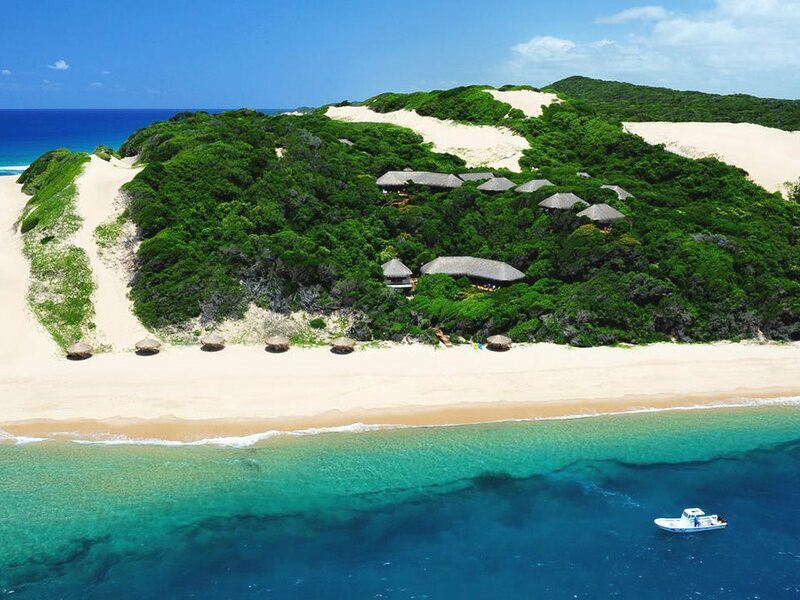 Ossimba Beach Lodge is a tropical paradise getaway overlooking a privately owned and secluded beach at the entrance of Nacala Bay in northern Mozambique. Friendly owner-manager Kevin Kitley has put together a stunning little lodge of 8 hugely spacious villas built on 1.5km of pristine beach. 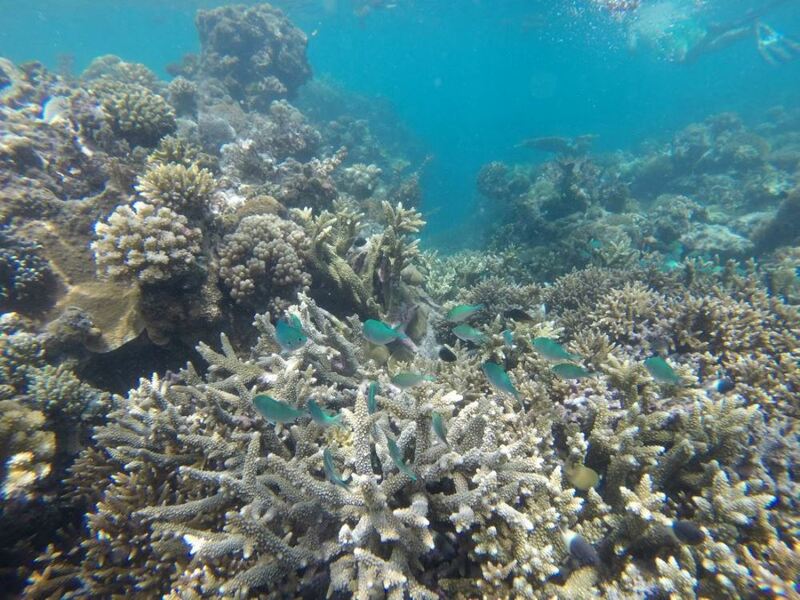 Ossimba offers excellent scuba diving, snorkelling and other water sports activities - being at the entrance of Nacala Bay, the water is crystal clear most of the year and the reef is protected as a marine reserve which has already boosted the fish numbers seen on the reef considerably. Ossimba has excellent eco-credentials being purely powered by solar energy. 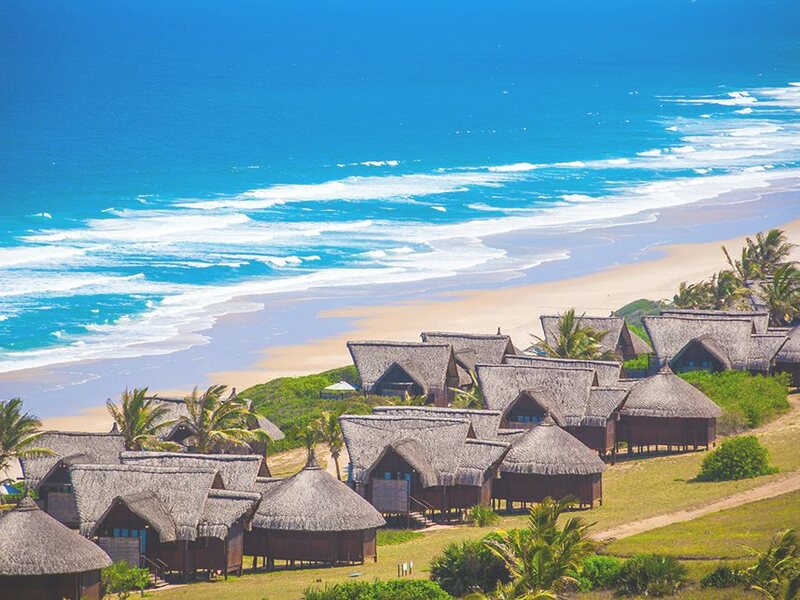 The 8 huge thatched villas are located just above the beach and have uninterrupted views of the sea whilst offering privacy and peace (being spaced at least 15 metres apart) and are surrounded by indigenous bush studded with baobab trees. The 8 en-suite villas are spacious (110 sqm each!) luxurious and tastefully furnished, boasting king sized beds with quality cotton percale linen, large mosquito nets (which also adds hugely to the romance factor!) and wooden paddle fans. 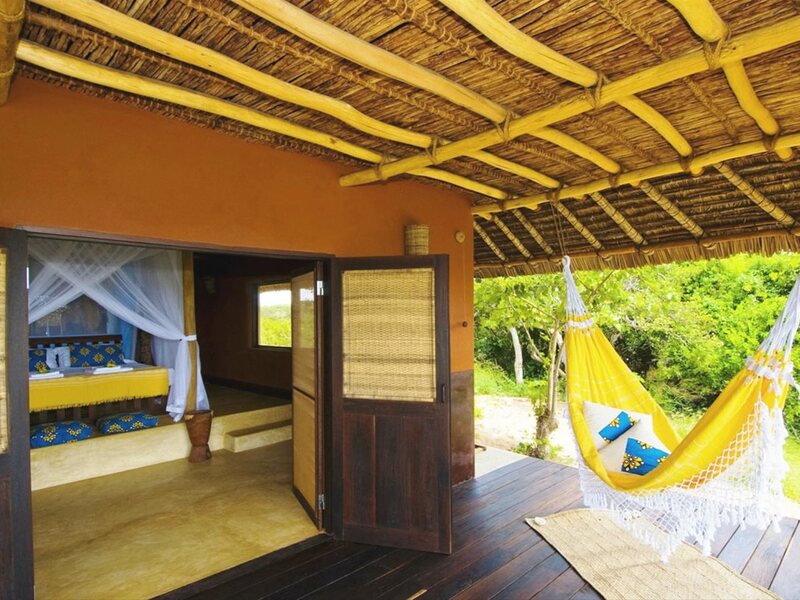 Being powered by solar doesn’t allow the use of air-conditioning, but the combination of the fans, gorgeous high thatched roofs and being open to the cooling sea breezes keeps things comfortable even in the heat of summer. 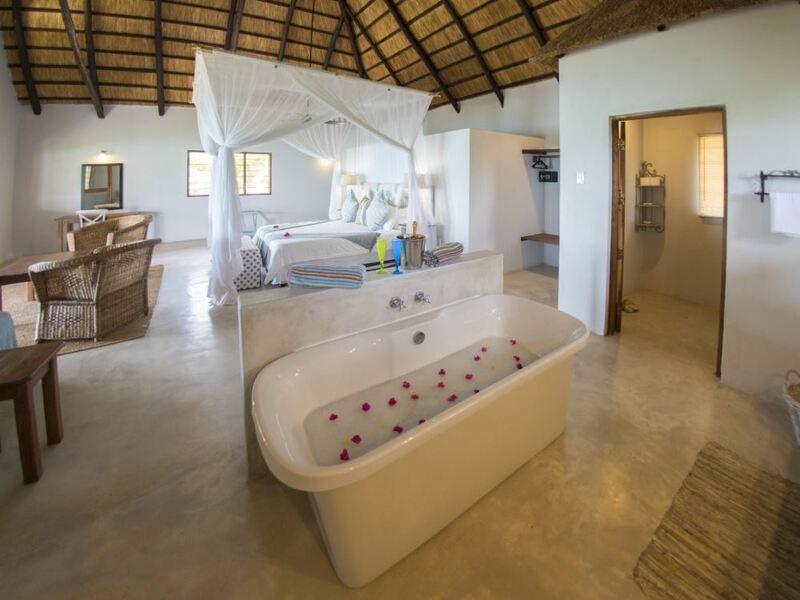 There is one Honeymoon Villa which also features a gorgeous standalone bath as well as the usual shower. Each villa is situated in such a way that access to the lodge’s public areas is quick and convenient should guests want to pop along there for a drink or meal. This relaxed and spacious entertainment area includes a large bar and restaurant area, two luxurious lounge areas, WIFI and Satellite TV, whilst the lodge’s swimming pool is positioned handily alongside so you can easily order a refreshing cold drink from one of the friendly staff whilst relaxing around (or in) the pool. After a busy day out in the sun or in the water, there’s nothing better than heading for the Sunset Bar, where carefully created tropical cocktails are the perfect accompaniment to the mesmerising view of the Nacala granite mountains across the bay! Dining at Ossimba Beach Lodge is a consistent delight, with a menu that uses the freshest sourced locally ingredients, while a selection of local beers and an extensive list of wines and spirits are the perfect accompaniment to a memorable meal. That freshly caught tuna or dorado just brought in by the local fishermen is likely to hit your plate in delicious style just a few hours later! There is no shortage of adventures and activities to enrich your stay at Ossimba. The protected coral reef just a few metres out from the lodge makes scuba diving an absolute must for qualified divers who are likely to be awestruck by the bright and beautiful underwater coral community teeming with marvelous marine life. Expect to come face to face with a diverse collection of reef fish, shrimps, moray eels, turtles and even the sought after nudibranchs! In addition to the house reef there are a number of deep wall dives and wrecks across the bay, at Baixa do Pinda to explore. If you’re not a scuba diver fear not as the underwater delights of Ossimba are still accessible to guests in the form of snorkelling on the house reef in front of the lodge – an activity that all lodge guests should definitely take advantage of! Fishing and whale watching in season are some of the other activities included whilst kayaks and stand-up paddleboards are great fun on the calm water usually found in front of the lodge. If you fancy just chilling then you can soak up the incredible bird life teeming in the 50 hectares of beautiful indigenous forest that surrounds the lodge! Walking trails, day trips to the World Heritage Site of Ilha do Mocambique and sunset boat cruises are also available.